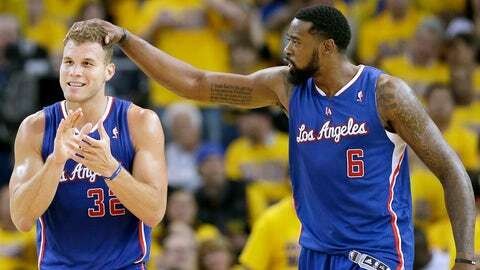 Clippers' Blake Griffin (left) celebrates with teammate DeAndre Jordan in Game 3. Los Angeles won 98-96. There should have been no doubt this postseason would be a good one. The traffic jam of talent out West coupled with the parity that is the East has left us with some remarkable games in this first round. There have been four overtime games and only six double-digit wins to this point. Thursday night’s action was no different. Golden State pushed back on Los Angeles, only to fall short because of a controversial non-call when Chris Paul made contact with Stephen Curry. Oklahoma City found it way too easy to miss three-pointers and now its back is against the wall. Out East, the not-so-loveable Pacers are falling even further into trouble. Takeaway: When Chris Paul went down early in the regular season, it became the soil for the growth of Blake Griffin. It’s when Griffin learned to take over, to be a complete superstar on his own. That’s all paying off this postseason. The Warriors simply don’t have an answer for Griffin, who had 32 points and eight rebounds. Without Andrew Bogut, the lane is a playground for the Clippers’ bigs. DeAndre Jordan had 18 points, 22 rebounds, 5 blocks and plenty of scares against Warriors daring to attack the rim. Star review: Paul said after Game 3 that he’s trying to be like Tony Allen and be the defensive stopper. Despite grabbing at the back of his leg multiple times on Thursday, he remains a pit bull defensively, barking down the customary three-point runs of Curry. When Curry lifted for a last-second three-pointer that would have won the game for Golden State, Paul moved his forearm into Curry’s body. It was probably a foul, but it was also a veteran move and a quite good one. The Warriors would have won on Thursday if they shot anything better than 19.4 percent (6-of-31) from three-point range, which is the worst they’ve shot in a postseason since 1994. Golden State needs to hit open threes and stop turning it over. If they do, then homecourt is likely enough to even the series at 2-2. They still will need to figure out how to get Curry going earlier. Takeaway: It’s always the blame game in a playoff loss, and Game 3’s winner is regular scapegoat Russell Westbrook. Not because he wasn’t brilliant at times or was much worse than Kevin Durant, but because his three-pointer with 27 seconds left in overtime exposes one big issue for OKC: they do not need the three. Westbrook hoisted the ill-advised shot, missing it and a wide-open Serge Ibaka under the rim, and the Thunder went on to lose. Of course the Grizzlies obviously deserve credit for some of this. OKC did get plenty of good, open looks, but the way Memphis clogs the lane with Marc Gasol and Zach Randolph has a way of convincing scorers to settle for easier, outside shots. Star review: It’s much less trendy to blame Durant, because you see it from him far less, but he was just as guilty at 0-of-8 from three-point range. He did shoot 52.6% on two-point field goals, and that’s where he needs to continue to be the creative scorer that makes him so impossible to guard. There’s another school of thought here too: Does Durant hoist threes because he’s afraid if he doesn’t, Westbrook will? It’s possible. Well, now it’s time we find out just how Durant and Westbrook look under complete pressure. Down 2-1 now, and playing in Memphis where the Grizzlies have won 15 straight, the season could rest on how Game 4 goes. Obviously there’s a greater sense of urgency, but OKC can’t panic and start launching threes again. … Maybe Scott Brooks should run more of those four-point plays. Takeaway: This is no fluke. The Hawks are completely outplaying the Pacers. Forget that No. 1 seed vs. a No. 8 seed with a losing record element here, because at this point it’d be tough to find a team that’s been worse than the Pacers. Indy earned its placement at the NBA’s table of elite because of defense. But even holding the Hawks to 38.4-percent shooting won’t be enough when the combination of Paul George, George Hill and Roy Hibbert shoots 6-of-31 (19.3 percent). Star review: The Hawks’ offense was just as dreadful, but they did get to the line 16 more times (37-21). The other difference was a late three-pointer by Jeff Teague that was prepped by Kyle Korver’s four three-pointers. It’s hard to call it an upset since it seems so much more sane to call the Hawks favorites at this point. It’s becoming less and less of a delicate call for Frank Vogel at this point: change up the rotation and offensive game plan. Mix it up. It’s time. If not, the team will continue to drown. Follow the NBA playoffs with Jimmy Spencer on Twitter @JimmySpencerNBA.